October 2016 sees the issue by NMC of a fascinating CD of memorial music for brass band, commemorating the two World Wars, as well as in memory of Benjamin Britten. 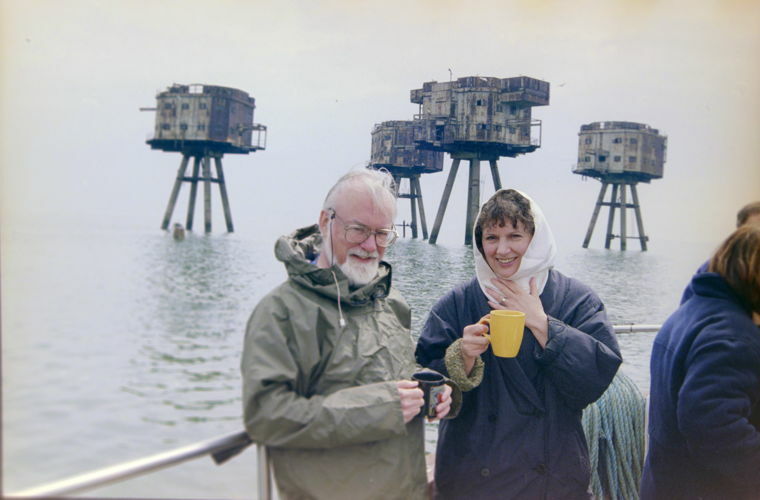 The longest work featured is John McCabe’s last and possibly finest brass band work, The Maunsell Forts (Nocturne for brass band), performed here live, from a concert dating from 2010, by the Cory Band from Wales, conducted by Robert Childs. The Maunsell Forts takes its name from the several sets of defensive emplacements out at sea in the Thames/Medway Estuary, designed by Guy Maunsell. These lonely groups of gun emplacements and living quarters, linked by walkways, formed the first defence in World War II against invading bombers and submarines from Nazi Germany, and they were set upon sandbanks such as the evocatively-named Red Sands and Shivering Sands. The work of the defenders combined loneliness, boredom and fear in equal measure. The forts themselves resemble most the Martian tripod invaders from The War of the Worlds, and they still exist, mouldering in degrees of disrepair, as a memorial to the dark days of war. John McCabe visited these forts by boat from the North Kent coast, and the resultant work combines both admiration for the defenders’ courage and sorrow for the anguish of war. Other works on this CD include two by Robin Holloway, War Memorial I (Men Marching) and War Memorial II (From Hills and Valleys). The CD begins with Britten’s Occasional Overture, arranged by Paul Hindmarsh for brass band, and also contains Britten's St. Edmundsbury Fanfare, interspersed by works by composers Simon Dobson, Gavin Higgins, Paul McGhee and Lucy Pankhurst, in performances by the Tredegar Town Band, also from Wales, conducted by Philip Harper. War Memorials is recorded on NMC D226.